Within the Philippines’ 7, 100 islands lay not just a hodgepodge of colorful cultures and traditions. A closer look will reveal a rich flora and fauna that are certainly one of the best in the world. In fact, with 7, 492 species of plants, birds, amphibians, reptiles, and mammals currently in existence, Philippines is one of the richest biodiversity hotspots ever known. But aside from the tamaraw, tarsier, and pilandok, there are also other lesser-known national treasures only discovered recently. Some of these species possess distinct qualities that are clearly out of ordinary. Brace yourself for a list of extraordinary animals you won’t believe are in the Philippines. 3. Cantor’s Giant Soft-shelled Turtle. 1. 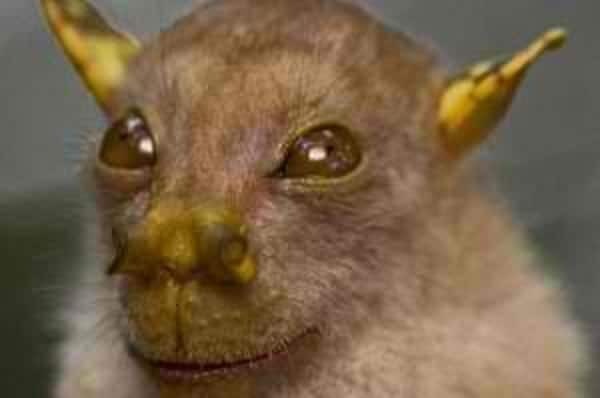 Philippine Tube-nosed Fruit Bat. With a purple carapace (shell) and reddish claws, these Palawan crustaceans can easily stand out if placed side by side with other crabs. 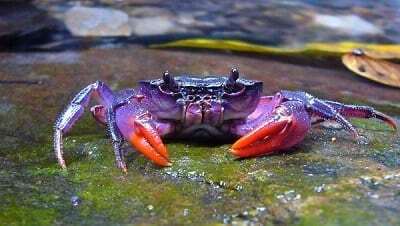 In 2011, four new species of purple crabs were discovered in remote areas of Palawan yet the world of biology couldn’t get enough of these colorful creatures. Among the four, Insulanon magnum (53 mm x 41.8 mm) reigns as the biggest while Insulanom porculum (33.1 mm x 25.1 mm) is declared the smallest. The other two species are Insulamon johannchristiani and Insulamon palawense. Compared to the mythical fire-emitting monster, flying dragons or Draco lizards (Draco volans) are smaller and less dangerous. 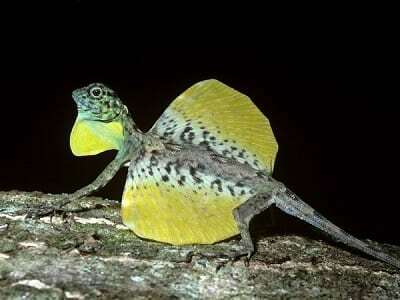 They usually eat tiny insects and use their elongated ribs to aid in flying or gliding. Flying dragons use their ability to navigate the forest air to find mates, locate preys, and protect their territories. 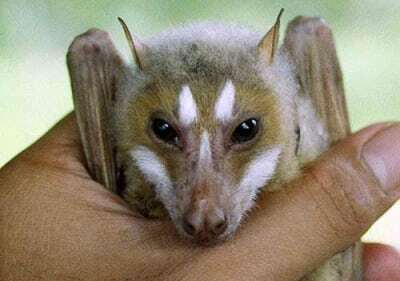 Also known in the scientific world as the Mindoro stripe-faced fruit bat (Styloctenium mindorensis), this unusual creature was one of the Philippines’ newest discoveries. When explorer Jacob Esselstyn heard vivid descriptions from the locals of Batong Buhay in Occidental Mindoro, he was skeptical at first. But not long after that, the discovery of the “flying fox”–which turned out to be endemic to Mindoro–led to a formal description of the animal published in the August 2007 issue of the Journal of Mammalogy. Fast fact: Upon discovery, the Mindoro stripe-faced fruit bat finally joined its relative, the Indonesian Styloctenium wallacei, under the same genus. They are usually referred to as the “flying fox” because of their facial features. Looking at their distinct white beards, one will immediately notice that Palawan bearded pigs (Sus ahoenobarbus) are not your ordinary baboy ramo. Aside from the white hairs covering most of their face, Palawan bearded pigs also feature longer snouts and canine-like teeth. These gentle animals are endemic in the Philippines particularly in the islands of Calamian, Balabac, and Palawan. Fast fact: Before they were officially named as ‘new species,’ Palawan bearded pigs were classified as a subspecies of Bornean bearded pigs. But unlike the latter, Palawan species are more sedentary or “laidback” in nature. 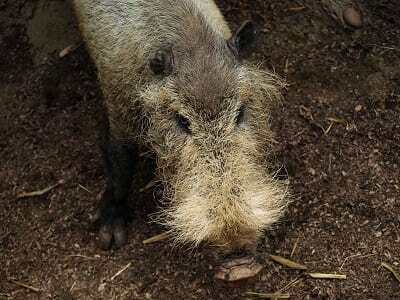 Males are more solitary while female bearded pigs tend to form a community or “matriarchal groups” to perform several group tasks such as territorial defense. 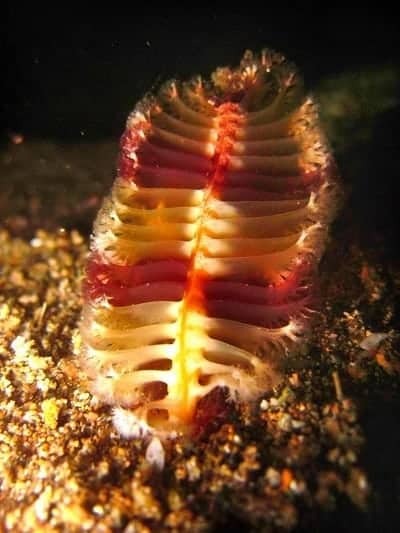 Sea pen has a stunning resemblance to classic quill pens, hence the name. But these soft corals of the order Pennatulacea can also be seen in the shape of an umbrella or even a golf club. Like other coral species, sea pens also feature individual polyps with eight tentacles for catching planktons. They bury themselves under a wide array of substrates—mud, sand, or solid rock—and easily detach once they decide to look for a new home. Fast fact: Sea pens are only one of several marine species discovered in the Philippines’ Verde Islands during the Philippine Wildlife Expedition in 2011. They can grow up to 3 meters tall and survive a wide range of marine habitats including the dark sea floors near Antarctica. At first glance, this bottom-dwelling sea creature can remind us of our favorite home-made pancake drizzled with cheese and chocolate syrup. 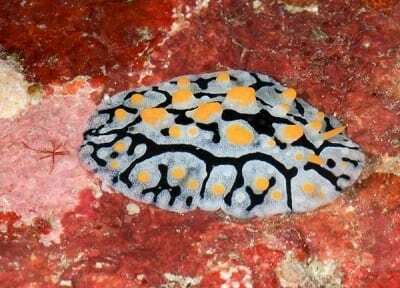 But behind its harmless look, this sea slug (scientifically known as nudibranch) hides a fierce appetite. Popularly known as “high-fashioned models” of the sea, nudibranchs get their captivating colors from the creatures they eat. Sea “pancakes”, for example, are just as carnivorous as other species, feeding on a variety of animals ranging from barnacles, sea anemones, sponges, hydroids, and even other nudibranchs. Fast fact: Found in the Philippines’ Verde Island Passage, the pancake-shaped nudibranch shown above is only one of the 800 species inhabiting the country. The name implies a humongous sea monster but with a size of 10 cm (think: prawn), a terrible claw lobster certainly won’t break your neck. 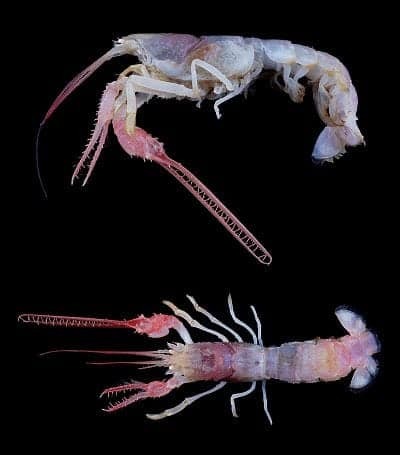 This new species of the marine creature was first discovered off Luzon islands in 2007 and later earned the scientific name Dinochelus ausubeli. The genus “Dinochelus” literally means “terrible claw” while the species name was named after Jesse Ausubel, renowned sponsor of the Census of Marine Life. Whenever we hear “turtle”, the sluggish image of pawikan easily comes to our minds. Yet with its distinct shell (carapace) and odd behavior, Cantor’s giant soft-shell turtle (Pelochelys cantorii) is born to stand out. Named after a Danish zoologist, Theodore Edward Cantor, this freshwater turtle can grow up to 6 ft (2 m) and usually spends most of its life hidden in the sands of the Philippines and other Asian countries. They’re mostly carnivorous—feeding on mollusks, fish, and crustaceans. 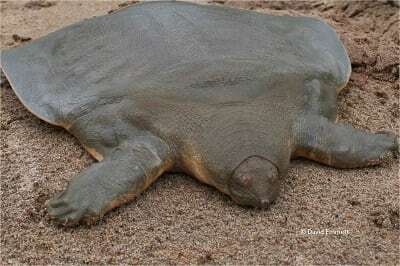 Fast fact: Cantor’s giant soft-shell turtle is rarely found perhaps due to its solitary and ‘motionless’ lifestyle. In the Philippines, one of the most recent Cantor’s ever found was a juvenile turtle captured by a fisherman along Addalam River, Cabarroguis, Quirino, Isabela. 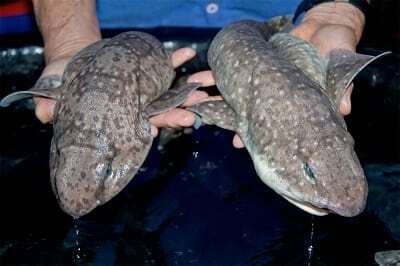 Although not as formidable as other species, “inflatable” sharks (known locally as bubble sharks) made it to our list due to its fascinating feature. As their name suggests, inflatable sharks have the ability to puff up by pumping water into their bellies. As a result, these shrimp-eating sharks can instantly increase their size and scare away predators. Fast fact: Inflatable sharks are one of the new species of marine creatures discovered in Philippines’ Verde Island Passage—a strait that separates Luzon from Mindoro and widely known for its rich marine biodiversity. With laterally pointed, tube-like nostrils, this winged creature is one of the strangest-looking bats you can ever find. Philippine tube-nosed fruit bats (Nyctimene rabori) are critically-endangered animals gliding in the air of Sibuyan, Negros, and Cebu rainforests. 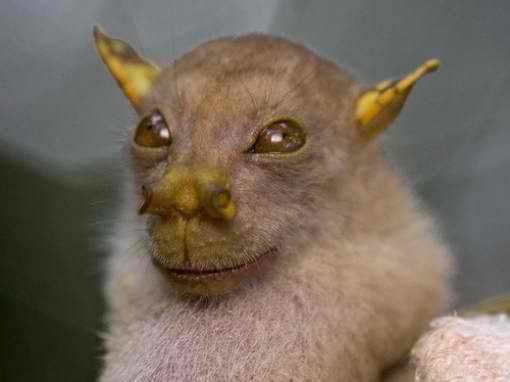 Despite their distinct and alien-like faces, Philippine tube-nosed bats have been known to only feed on wild figs and insects. Fast fact: Unlike other species, Philippine tube-nosed bats prefer to roost in trees instead of caves. However, this unique characteristic has also halted their proliferation. merong Cantor’s Giant Soft-shelled Turtle sa creek ng festival alabang e andami pa! 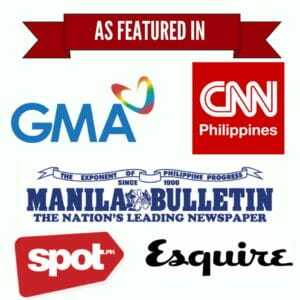 may maliliit at malalaki kasama ng mga ibat ibang isda dun! kaya isa sa fav. spot ko yung creek dun e ..til now makikita nyo pa Cantor’s Giant Soft-shelled Turtle dun! Itˇs really a cool and helpful piece of info. I am satisfied that you simply shared this helpful info with us. Please stay us up to date like this. Thanks for sharing.